The exhibit hall brought a few surprises at this year's NAHC conference and expo. Among familiar vendor logos suspended like stalactites from the ceiling were startups exhibiting for the first time. It turned out, however, to be who was not there that raised eyebrows. Telehealth vendors, formerly a mainstay of home care conferences, were either in scaled-down booths or MIA. We found Honeywell in a 10x10 corner booth and had a good discussion about the pioneering telehealth company's products and plans, which continue be center around placing remote patient monitoring devices in the home. But their primary competitors, Philips and Medtronic (formerly Cardiocom), were nowhere to be found. Even smaller but longtime players in the sector such as AMC Health and Viterion did not attend. We even found AMC's former sales VP Chris Taylor in the Kantime booth, where he had just taken a job with the same title four days earlier. Are these large international companies signaling that they are throwing in the towel on the home health market? Has the wait for public and private payer reimbursement been too long? The adoption rate too slow? If they are they turning their attention to more lucrative markets, where reimbursement codes have recently been designated, who would blame them? We have been warning for years that if home health and home care do not provide remote monitoring services to patients recently discharged from hospitals and skilled nursing facilities, someone else will. Perhaps that warning is coming true. Physicians and hospitals are sending discharged patients home with telehealth systems and using their own staff to monitor them, bypassing the need for a home health nurse or a home care aide. If that is where the money is, it makes perfect sense that telehealth companies would make the business decision to turn their sales efforts toward it. In place of the giant exhibit hall telehealth displays of yesteryear were a number of small booths with a new take on remote patient monitoring. We spoke with a company called SNAP40 that was introducing a wearable, wireless vital sign monitor. The patient slips it over the upper arm and goes about normal daily activities. Vital signs are sent to a hub in the home that attaches to the world via cellular networks or Wi-Fi. The device's rechargeable battery, we were told, last about three days. Typically, a patient would be given two, one to wear and one to charge. True to the scaled-down remote patient monitoring movement we detected, Synzi came to Dallas to talk with Healthcare at Home providers about a tablet-based video visit system that can, Sales VP says, help providers conduct three video visits for every one in-person visit. Video conferencing and secure messaging keep patients in touch with caregivers but also with family. The system can also be deployed on smartphones and laptop and desktop PCs. The Care Button is a Texas company that is dedicated to "making the panic button easier" for patients to use. CEO Jens Kolind told us they found that many elderly people are reluctant to be a bother, or to risk an ambulance ride, so they often decide not to press their call button on their PERS necklace or wristband, even when they are genuinely in need of help. By connecting their button to a family member, a home health nurse, a neighbor, or a 24/7 call center, depending on the time of day and the profile of their condition, instead of a 911 operator, they are finding that help is summoned far more often. Sometimes just a phone conversation solves the problem and an ambulance is not needed. Knowing that, Kolind said, is a game-changer for vulnerable persons living alone. MobileHelp is another PERS company that is actively seeking post-acute care partners. The product line includes a couple of familiar emergency button systems but also includes a wearable that has some unique features. For $350 and a $25 monthly fee, an at-risk person who is not homebound can obtain a complete PERS system in a wristwatch. 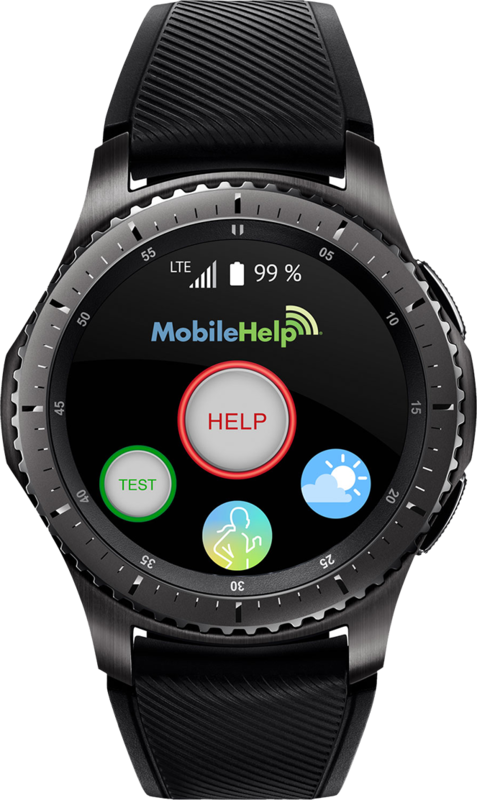 With its partner Samsung, MobileHelp has developed a wearable that does not look like a medical device. It is an attractive watch that reports steps, heart rate, and calories burned but can also summon emergency help at the touch of a button. It uses a popular 4G cellular network and GPS tracking. It functions as a phone to speak directly to emergency operators. It's battery should last about two days per charge. Tellus is a company responding to the upcoming EVV mandate for Medicaid providers. 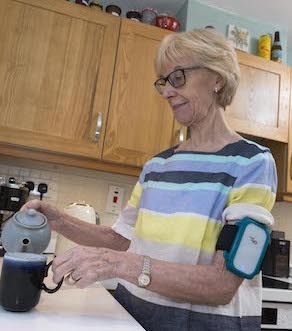 Its smartphone-based system makes it simple for a care worker to check in upon arrival, check off tasks completed, and check out when ready to leave. It uses GPS geofencing to verify check-in location. We were told by company Training Manager Augusto Sandino, however, that the system goes beyond that. The app can also be used to verify eligibility, schedule appointments and track time and attendance, generate alerts when visits are missed or late, integrate with billing and claims processing, generate business reports, pre-adjudicate claims, and integrate with financial management systems. Device security and management can be added as an option. Next week: There was more we found while wandering the NAHC Conference exhibit hall besides these new remote patient monitoring companies. In our next issue we will look at the rest, including familiar companies with big product announcements.